Kicked off week 2 on Monday with a very difficult 5 miles. It’s my own fault for not running in the morning (woke up with a vicious migraine that made me late for work though), and had to go out in the evening heat – 84º, even at almost 7pm. Took several mini breaks in the beginning (dizzy!) and ended up stopping at around 2.5 to walk for a half mile thinking I wasn’t going to finish the remainder, but was blessed with a second wind out of nowhere and finished the rest. My watch was paused during that walk break, so the whole thing wasn’t exactly seamless, but it got done…mostly. It was supposed to end with four strides that I wimped out on. The discomfort of this run was enough to really drive home that I HAVE to run in the morning when I know it’s supposed to be crazy hot later, and I’ll remember this run when my alarm’s screaming at 5:30am. The reality was a complete mess. My first mistake was leaving my watch set to show the total average pace instead of the current lap (mile), so I had to pay attention to each mile and rely on feel throughout, and manically check for the lap pace alert. These are the splits, and I included the reaction I had to each alert. Something else to work on, obviously. To be fair, I’ve never really caught on to tempo runs so I’m used to just staying away from them altogether. But I’ll practice and get better and it’ll be fine. 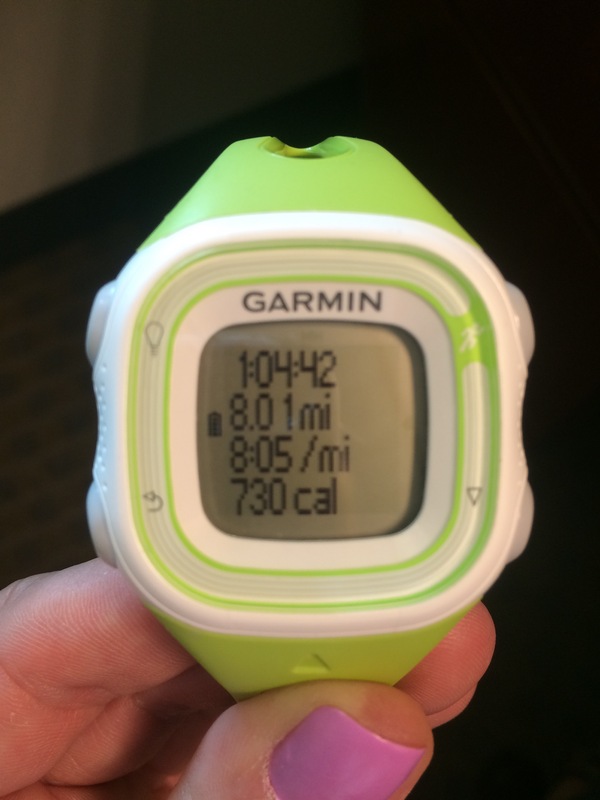 Yesterday I rested (no more 3 rest day weeks after this one, *tear*), and today was 5 slow that I ran in the morning. I’d planned to tack on the forgone strides from Monday onto this one, but moved wayyyy too slow after waking up, so that didn’t happen (and I still feel terribly guilty about it!). At least now there’s a post with a picture though. I was wayyyy too irrationally upset this morning, but I know I’m not the only one who would have a conniption over it. Man, I really wanted to go over those splits! This is why they say runners are crazy. Now that several hours have passed, I think I’m ready to move on. So! First long run is done. I wanted to get it out of the way before the weekend and figured I’d take advantage while I have a single-digit long run and do it this morning before work. Had to get up a little earlier (5:15; usually my alarm goes off at 5:30 on run mornings) but it wasn’t so bad. I’m a horrible procrastinator that early and really need to stop screwing around on my laptop while I’m having a cup of coffee, because I almost always end up out about 15 minutes later than I planned. Today I wanted to be running by 5:45. I ate a couple graham crackers (I don’t usually eat anything unless I think I’ll be out longer than an hour; my stomach can’t handle too much that early) and stretched out the coffee. Started at 5:59 so I’ll give myself a half pat on the back since it was before 6am. This run was supposed to be a steady pace falling between 7:39 and 8:09. Started off slow (first mile was 8:45 I think? ), and I wouldn’t call it “steady”, but ended up with an 8:05 avg, which I’m very happy with. I think mile 2 was like 8:3X, mile 3 8:2X, and then I can’t remember how it went after that. There were some 7:50s and 7:40s interspersed in there, but I’m almost positive I never dipped below 7:40-something, and I felt good throughout most of it. The weather was cooler than it’s been in a while, so that helped. I’ll give it a 7/10. Overshot the distance and finished about a quarter mile from home, so I shut everything off and just jogged real slow the rest of the way to cool down. If I’d had time I would have spent it with the foam roller since by around the 5th mile or so my IT band was getting pissy, so I’ll have to do that later when I get home from work. Today was supposed to be a rest day (this is one of the only weeks where there’s three rest days instead of two), but I ran tomorrow’s workout because I may go out of town this weekend and wanted to move the schedule up a day. Plus, I was up and in the mood to get out there and you have to take full advantage of that! 5+ miles slow this morning, pace ended up at 8:27 avg, so I should have chilled out a bit. The “+” is for strides added on at the end. This is new for me; the only time I’ve ever run strides was the day before a bigger race as a warmup. Whenever I think of strides, I think of a person literally striding with legs stretched as far as they can go, even though I know better. Strides are pickups of about 60 to 100 meters or specific short increments of time (in my case) tacked on at the end of an easy run. The idea is that you get used to speeding up at the end so you can pull out that “kick” when approaching the finish line at a race. It’s a nice way to incorporate some speed work semi-painlessly throughout the week instead of having one or two really intense designated speed centric days. Either way is fine and definitely benefical, but I think this approach will work well for me. I’ll be doing strides several times a week throughout this cycle, increasing the number as it goes on. Today was nothing crazy, just two 30 second strides at 95% intensity (whatever it happens to be any given day, just have to feel it) with a 2 minute slow rest in between. I’m supposed to be doing 20 second strides, but will do 30 seconds moving forward because I want to use the run/walk option on my Forerunner and you can only set that for 30 second increments (grr!). It worked well today though, and it’s amazing how quick 30 seconds (and 2 minutes) goes by after you’ve been running for a while at a consistent pace. I might even say I had fun with it? ?